1).Which of the state has just celebrated its 54th Liberation Day? 2).Which state has planned to raise the student force which will play vital role in security in schools? 3).Which city hosted latest round of annual China-US high-level talks on trade? 4).Which Political Party was banned in South Korea for supporting North Korea? 6).According to Finance Ministry what is the expected India’s GDP growth in 2014-15? 7).Around what _____ percent of the investors in stock markets come from top 15 Indian cities of the country? 8).Which telecommunication network has suffered by cyber attack recently? 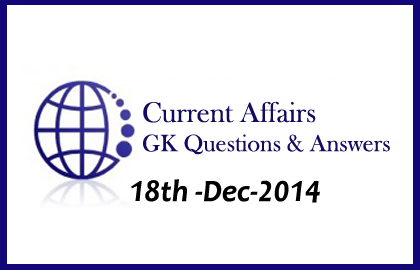 9).What is the name of the Indian Coastal guard ship that recovered ISRO’s unmanned crew module? 10).Under Motor Vehicles Amendment Bill-2014, loan at a rate of ______% interest will be given to own an e-ricksaw?